If Shane Black’s goal was to put a nail in Fox’s The Predator franchise, then well done and congratulations. The latest entry in the lethal creature from outer space series is one of the weakest of the franchise, which is a shame as the ensemble appeared to be all-in on resurrecting the series. An alien spacecraft crashes into the jungles of Mexico, close to where Quinn McKenna (Boyd Holbrook) and his fellow soldiers are patrolling. Quinn quickly deduces he’s in a life or death fight with an alien and once he gets the upper-hand, he takes the time to steal the alien’s helmet and one wrist guard before skedaddling out of the forest. Quinn’s alien encounter is covered up and he’s sent off to the psych ward. Fortunately for him, he’s not the only soldier being sent off to a locked facility and on the bus ride he meets an odd assortment of fellow psych patients. Baxley (Thomas Jane) spouts always inappropriate obscenities due to Tourette syndrome. Lynch, played by Game of Thrones’ Reek, Alfie Allen, is a fellow prisoner who’s only real contribution to the mission/film is performing card tricks. Keegan-Michael Key’s the jokester of the group, the deliverer of snappy one-liners, and that’s pretty much all we learn about his character. Trevante Rhodes plays the straight man of the group, the de facto leader until Quinn commandeers that position. Meanwhile, the injured Predator is brought to a secure facility run by a real looney bird named Traeger (Sterling K. Brown). Traeger brings in scientist Casey Bracket (Olivia Munn) to help figure out why there’s an anomaly in the creature’s DNA that has no business being present. One thing leads to another, the Predator kills nearly everyone on the base, and the hunt is on. The Predator is an equal opportunity offender and no character emerges unscathed. 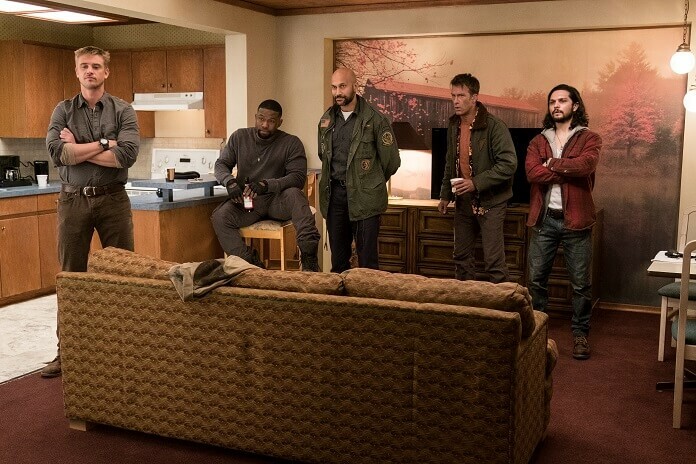 Brown’s Traeger is more of a threat than the Predator, and for some bizarre reason he’s more interested in killing off Quinn and the gang than the creature from outer space. Holbrook’s Quinn can’t hold a candle to Schwarzenegger’s “Dutch,” and there’s not a character in the group that leaves a lasting impression. A lazy script – this incarnation uses disabilities for laughs – makes The Predator a bit of a soul-sucking experience to sit through. The “thriller” also features some of the most jarring editing and continuity issues of any major release of the past decade. I can’t even recall a feature film that’s left me as frustrated over the random insertion of scenes that lack any connection to what comes before or after. The Predator’s a huge mess that’s full of missed opportunities. One-dimensional characters populate the film, with the only upside to their lack of development being it doesn’t matter when they’re killed off.